NEW BEDFORD, Mass. — Southcoast Health announced today that it has created a dedicated space on the fifth floor of St. Luke’s Hospital in New Bedford to specifically treat patients who have undergone or are in need of surgical intervention for a neurological or spinal disorder. Southcoast Health is taking this critical step in order to establish St. Luke’s as a comprehensive center of Brain & Spine services. As a comprehensive center, St. Luke’s will be capable of treating nearly all types of neurological and spinal disorders; expediting care, increasing the scope of immediately available procedures, and greatly reducing the need to transfer patients to other healthcare systems outside of the South Coast region. This newly dedicated area will increase the efficiency of coverage for providers and nursing staff — allowing a specialized team to care for Brain & Spine patients around the clock. This dedicated team will include Advanced Practice Providers (APPs) who will provide constant care to patients, and are able to accept new patients regardless of the time of day. The Brain & Spine team at Southcoast Health includes experienced specialists in neurosurgery, neurology, neuropsychology, pain management, physical medicine and rehabilitation, physical therapy and chiropractic services. They work together in partnership to provide a personalized, comprehensive approach to address the many aspects of complicated neurological conditions. These surgical and non-surgical services and treatments including stroke care, neuropsychology, brain and spine surgery, stereotactic radiosurgery, epilepsy surgery, pain management, spinal physical therapy and neurological rehabilitation. The Southcoast Brain & Spine program has recently received a number of national recognitions including the prestigious CareChex Top 100 Hospital for Major Neuro-Surgery distinction. 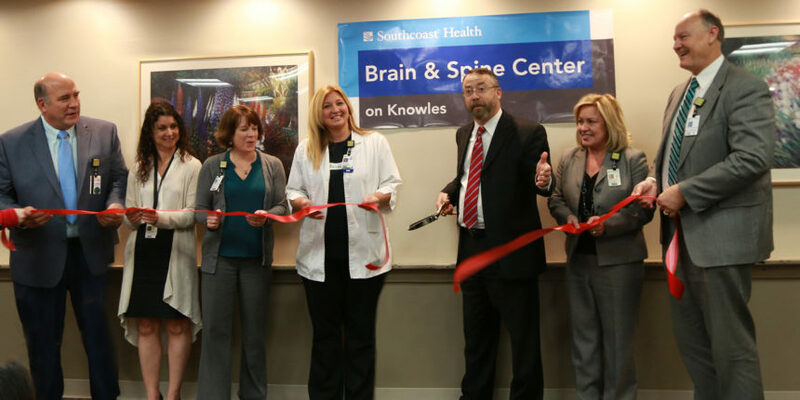 The Brain & Spine Center was also recognized by Healthgrades with the Stroke Care Excellence Award (2016), ranked Among the Top 10% in the Nation for Treatment of Stroke (2016), and as a Five Star Recipient for Treatment of Stroke (2012-2016). In addition, Becker’s Hospital Review named St. Luke’s as a Top 100 Hospital with Great Neurosurgery and Spine Program in 2017, and the American Heart Association/American Stroke Association with the Get With the Guidelines-Stroke Gold Plus Quality Achievement Award in 2015. For more information about the Southcoast Health Brain & Spine Center, visit Southcoast.org/brainandspine or call 855-778-0088.